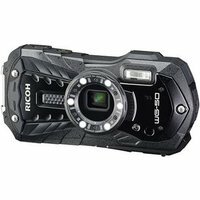 The Ricoh WG-50 Digital Camera is a rugged point-and-shoot camera for those in need of a camera that can take a beating. Waterproof, shock-proof, dust-proof, and crush-proof, the WG-50 can withstand most things you can throw at it. Its 16MP 1/2.3 CMOS sensor offers crisp high-resolution stills and 1080p video. Lithium-ion battery (D-LI92), Strap and Macro stand.